It was a gloomy Saturday night and it had rained constantly for two days here on the Isle of Man but, as a keen bird ringer and birder, I checked the weather forecast for the morning of Sunday 3 April and, finally, it was going to be clear and calm. I decided to visit one of my ringing sites, Wrights Pit North at the Point of Ayre, in the hope of colour-ringing some Northern Wheatears. I arrived at the site at approximately 9.20 am and noticed two wheatears in the far corner, so I set up and within three hours I had colour-ringed four of them, plus two Meadow Pipits and two Linnets. I then packed up, but as I drove towards the exit gate I noticed a pair of Common Stonechats. I set up next to some brambles by the exterior fence and walked the 30 m to my car to wait. After about five minutes, I noticed a bird fly across the heath from the coast and land in the brambles, showing a flash of black and white on what I thought was a longish tail. My first thought was that it was a Pied Wagtail. As I raised my binoculars I saw a small bird skulking in the undergrowth but couldn't get a clear view of its head. However, I did notice dusky grey markings on the side of the body feathers and a white belly. I wondered if it could be some kind of warbler, perhaps a Lesser Whitethroat. 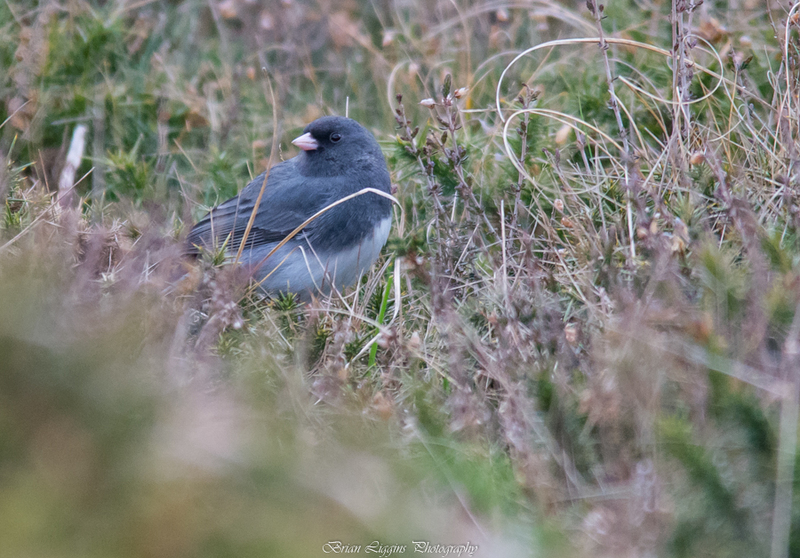 It then jumped out of the brambles onto the ground, and straight away I focused through the binoculars and couldn't believe what I saw: a Dark-eyed Junco! I watched the bird get closer and feed in the short grass for two minutes, and then reached for my camera to take a few record shots. It then jumped up onto the posts and dropped down on the other side of the fence. I walked around the corner and bumped into another birder, David Wright, who had just started undertaking breeding bird surveys for Manx BirdLife. 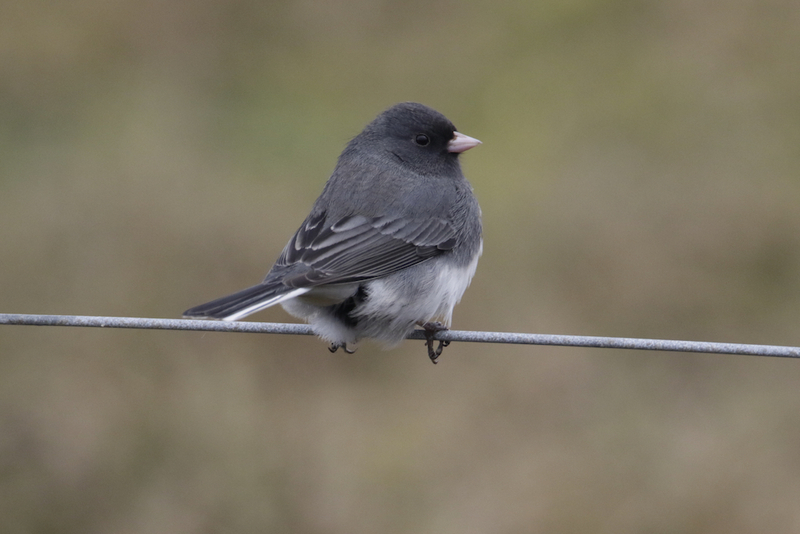 He asked me if I had managed to get some photos of 'that bird' sat on the fence post; I smiled and said "what, the Dark-eyed Junco?" and he smiled back replying "Yes". I then put the call out to our local birders advising them of my find. The bird was relocated 30 minutes later on Wrights Pit East about 150 m from where it was first seen. 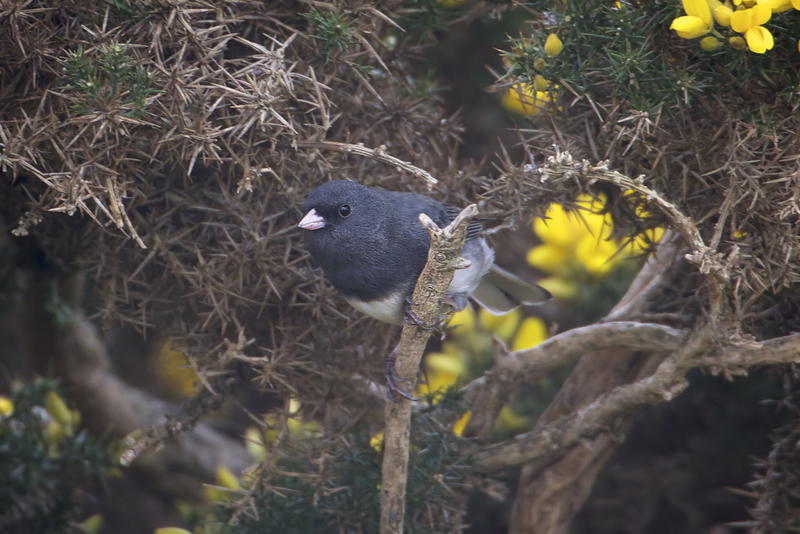 It showed well, feeding around the bottom of some gorse bushes, sometimes scratching with its feet to uncover food. The bird was watched for some three hours and stayed very localised within a 30 square-metre area. It was last seen around 5.15 pm still feeding in the same area. Birding can be hard work on the Isle of Man and lots of people spend a lot of their time for very little return. It's always good to see a rarity, but even better to get a first for the island, so today was a very good day.